On our way to visit Dominique Browning for our BEHIND THE Q weekend, Dr. Pat and I first stopped in to visit a longtime friend of hers, Andrew Grossman at his lovely home in Seekonk, MA. Although Pat had sung his praises as a landscape designer extraordinaire, little did I know the treat I was in for. or a detail of exquisite roses, every scene was camera worthy! I found it incredible that Andrew tends this entire property alone. There are so many amazing vignettes, that could be mistaken as coincidental successes, but I can assure you every inch is orchestrated to grow into a symphony of casual splendor. The back of the house is a lush haven reminiscent of a country manor you might see in a BBC series. The surprise is a checkerboard patio planted with thyme. 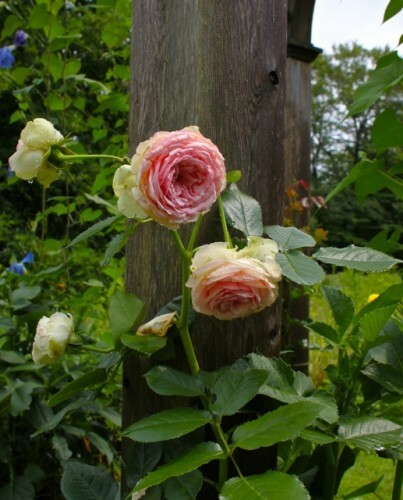 As soon as you round the corner, you are met with an incredible scent and if you rub your hand along the herbed squares, you can carry the wonderful aroma with you. Andrew’s own home is only one example of his talent. 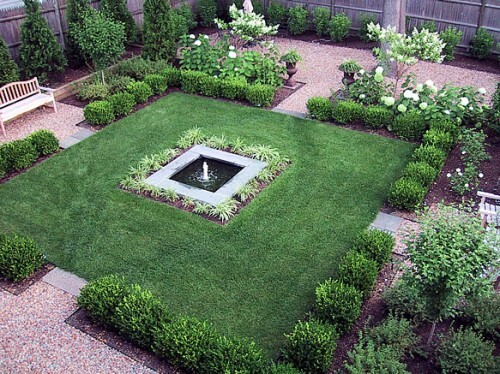 In looking at his portfolio (all photos below from there), you will see a variety of lovely landscapes such as this formal city garden in Providence with green and white plantings, square bluestone-edged fountain, peastone walkways and sitting areas edged in steel. 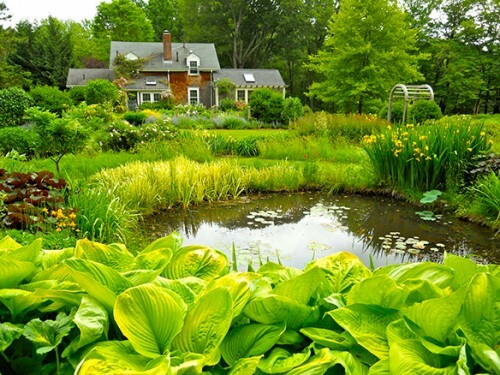 This lovely semi-circular perennial border backed by larch trees is in Bennington, Vermont. 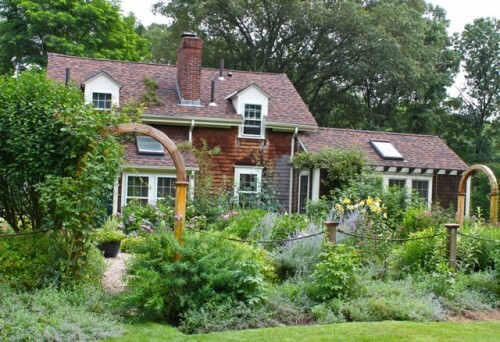 This swimming pool garden in Vermont with wooden decking and boardwalk and mixed planting of annuals, perennials and flowering shrubs was the Garden Design Magazine Golden Trowel Winner. 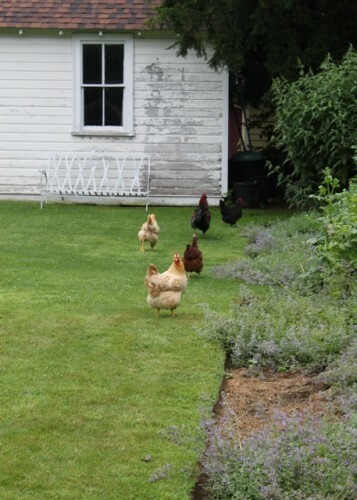 If you’d like to see more of Andrew’s work and his gardens, I encourage you to visit his blog. 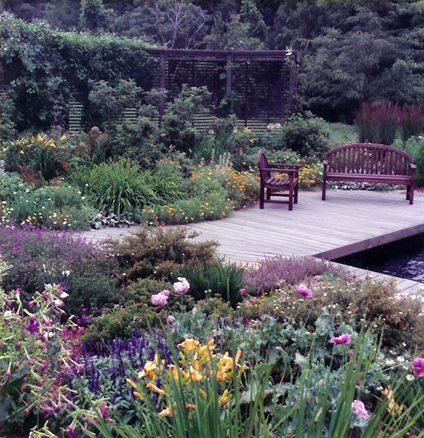 Andrew’s garden was part of the Garden Conservancy’s Open Days Program this year. 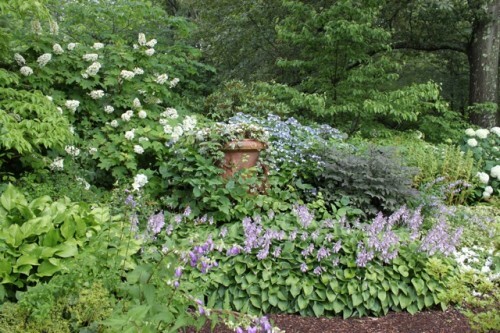 If you are going to be in the area, you may visit the gardens by appointment during the growing season. 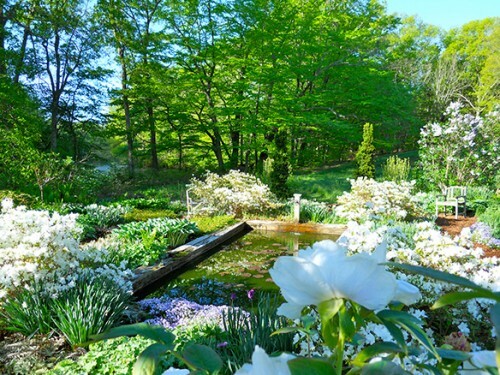 Tours and lectures for garden clubs and other groups may also be scheduled by calling (508) 336-3696. This entry posted in games, Uncategorized. 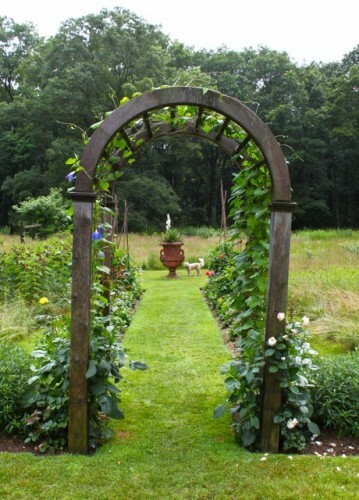 Entry Tags: Garden Conservancy Open Days, Landscape design Bookmark the permalink. Oh my this is the quintessential English countr garden with a lovely peacock as well! 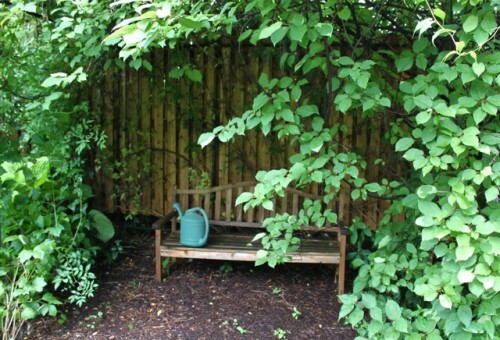 This was really an inspirational treat…I could pitch a tent and LIVE in this garden! Oh my, what a fine dose of beauty to wake up to. As always, thank you for introducing us to such talent! Now that is what I call art, not landscaping. Well, really all Horticulturalists are artists. What a treat! I feel like a slacker in the garden this year with everything up ended. Wow you aren’t kidding what a treat it is! 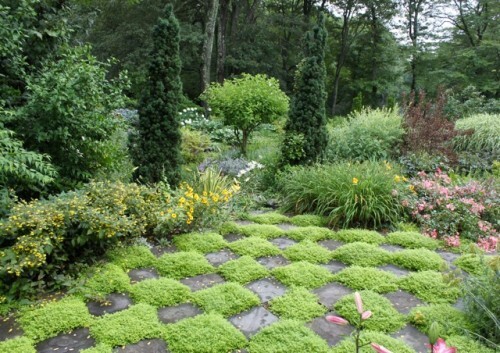 I love the checkerboard patio and of course the formal gardens are exquisiste, looks like something right ouf of the countryside in Europe…truly beautiful! The checkerboard planting and the chickens are wonderful…did the peacock screeeeech at you? I can’t decide which I like better, the more formal or the wilder look at his home. I agree with you…how does he keep up a job that big by himself? Love the garden, and love that he does all the work! I always say, why let the garden maintenance guys have all the fun? Really! Seriously? 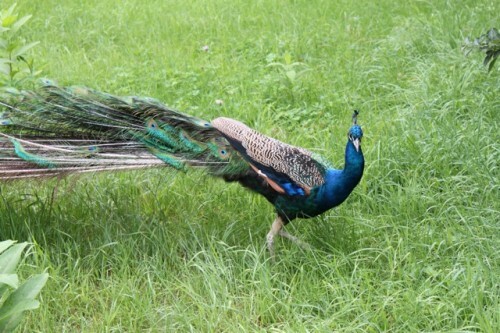 I mean there is even a peacock! I have plants in various stages of despair all around my yard. I like to blame the harsh desert climate but really I think it’s just me. His grounds are amazing, inspiring. The thyme checkerboard is my favorite. I can imagine strolling and dining there all the time, wonderful. I’m obsessing over the peacock, that blue is stunning. Oh my goodness, that is absolutely breathtaking!! It is unbelievable. I am speechless!! I think this may be my favorite of all your posts so far! You had me at the very first photo–I have such a weakness for beautiful gardens just like this and I will definitely check out his blog. Thank you for the introduction! Wow, the garden is unbelievable! 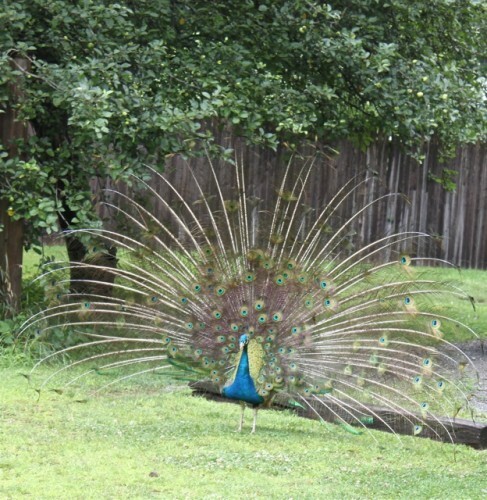 The peacock is pretty spectacular too! Oh Q – I could smell the grass and the roses from this lovely post – thank you!! Aaaaaaaaaaah! So beautiful! Almost makes me wish I lived somewhere humid. That man is very talented. Gorgeous gardens. He is very talented. Love the checkerboard ground cover floor. Would love to try something like that. love formal gardens such as french gardens and love old English roses as well..
Andrew has a lovely selection of plant materials and a lot of visual interest as well with the various rooms and vignettes..beautiful.. Very inspiring. Such beautiful designs feed the soul! Wonderful post. Oh what beautifully landscaped gardens! So inspiring. 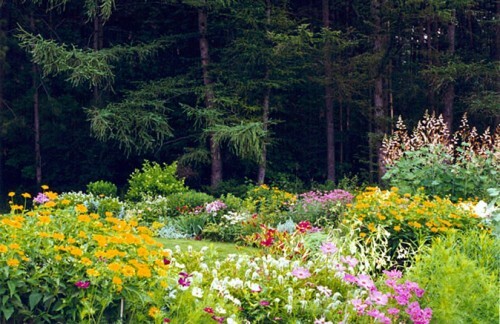 That really is one extraordinary garden! What a dream! His garden is absolutely beautiful. And I loved seeing other examples of his work. What beauty he creates, I am so impressed. Thanks for letting us know about this very talented landscape designer. Absolutely beautiful gardens. I love, love, love, the formal city garden with the fountain. 81 queries in 1.077 seconds.